Sienna Shared Blessings in Missouri City is a warehouse filled with donations for Harvey victims. Noreen Covey started the project because she was frustrated by the response from FEMA and the Red Cross after Harvey. She and her neighbors in Sienna Plantation were hit hard by storm damage. “We got hit with the tornadoes and the hurricane flooding,” said Covey. She knew she was onto something when trucks from places like Ohio, Michigan and Louisiana started showing up with donations. The Army donated jackets. Another charity donated 20,000 packs of underwear. But the families on her list, 137 in all, also needed furniture. Recently, she was told a Las Vegas entertainment group wanted to donate furniture enough for 200 families. While KPRC was there, she received a call from New Hope Church’s Event Coordinator, Nicole Liston-Tyson. New Hope Church is heading up the distribution of the Vegas donation. Nicole told her there was more furniture coming -- a lot more. The Vegas entertainment group was remodeling some of their hotels, and though they did not want to be named, they wanted to donate nearly 10,000 pieces of furniture. 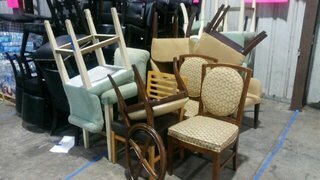 That furniture was being delivered to a Pearland warehouse. Eighteen-wheelers, also donated by the Vegas company, drop regular shipments off. It's there to help people like Miriam Leon, a single mother of four who lost everything in her ground-floor apartment. When Norreen and Miriam heard about the large donation, there wasn't a dry eye in the house. It truly became a day of blessings shared. The furniture is for Harvey victims. If you are a Harvey victim, you can apply. Fill out an application on the New Hope Church’s website. What if I need other items? You can check in with Sienna Shared Blessings Tuesday to Friday 11 a.m. to 2 p.m., Saturday 10 a.m. to 3 p.m. and Sunday 2 p.m. - 5 p.m.